With a name like The Funeral, one would expect some sort of black-clad goth act. Although there is a hint of that here, The Funeral are much more. There is a darkness to the music, sure, but it is the darkness of the nightclub, not that of the grave. 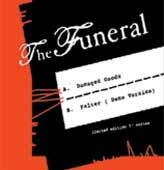 What i mean to say here is that The Funeral are a classic post-punk dance band, not some mopey depressed act. Actually, when i listen to The Funeral, i think that they are goth in the same sense that early Siouxsie and the Banshees, or The Cure's Seventeen Seconds was goth. It's actually slightly darker post-punk. It's got the trebly guitars and the predominance of synths that the early post-punks had started to play with. The vocals aren't the happiest things in the world, but the whole thing is wrapped up in a nice danceable beat. This is fun music, really. Okay, well, i have a press sheet here that says that this band is basically a two piece consisting of a drummer and a bassist, both of whom sing, and then they added a full-time producer to the band. Kind of like mid-era Underworld i guess. Apparently they were in some band in Texas that i had never heard of, and now they live in Denver. And as a debut, they have released a really fine post-punk EP. There are four songs here, let's go over them, shall we? The EP starts with a crunchy guitar riff and a bit of fuzzed out bass. Then the drums kick in, and the song moves into a rollicking groove. The tune is called Piss, and it features some really angry vocals screaming over a wall of grooved post-punk. It has an unstoppable energy, and i bet is very awesome in a live setting. The next tune up is a very timely cover of Gang of Four's Damaged Goods. This is actually a pretty faithful cover in that The Funeral play the song as it was designed, only they use updated instrumentation and recording techniques, and they don't have the deadpan British vocals of Jon King. Still, it's a great song, and i like what they have done with the synth line here, turning it into a fat throbbing riff instead of the thin warble that Gang of Four used. They also play the song a little faster, so what was a pretty good dance tune before is, in the hands of The Funeral, a song that deserves to be played loudly at nightclubs. Fine stuff. Big Shot features wobbly synths, echoed guitar, and some prominent, almost whining vocals. The voice here (clearly different than on the other songs) reminds me of some 80s band with Big Hair (Europe, perhaps) on the verses, then on the chorus the vocalist goes into a falsetto that really reminds me of Jimmy Sommerville (of The Communards). Anyway, despite that connection, this is a decent song. I would say that it is the weakest on this EP, but it's not awful by any means. The choruses are really nice, when the guitar stomps on its overdrive pedals, the drums kick it up a notch, and the falsetto comes in. I think the problem here is that this tune pales in comparison with its three siblings. Finally, The Funeral wrap up their Birth with Falter (Floor Mix). Strange to release of a mix of a song without the original. I sit here wondering what Falter sounds like without the Floor mixing. Anyway, by Floor, they mean "dancefloor", for this is an awesome electroclash tune that even The Faint would be proud of. Synths churn, the drum beat throbs deeply, and guitars whir and chime. The voice here is some unholy fusion of Xiu Xiu's Jamie Stewart (in his high pitched pseudo whining pronunciation style) and Fearghul Sharkey (in the natural tremolo of the voice, used to great effect). This song really rocks. So i really like this EP, and think that with a sound like this (very "today") and songs this catchy they could go far. Recommended if you like: Interpol, Franz Ferdinand, The Faint, etc etc. But, seriously, this is a good solid EP, and i do recommend it. Now, in addition to releasing this debut EP, The Funeral have also extracted two of their best tunes to release on a 7". The A-side is Damaged Goods and the B-side is Falter (Floor Mix), both excellent tunes. However, the single does annoy my pet peeve in that it does not anywhere feature the speed at which to play the single. (It's a 45 RPM single, which is expected, but not universal). 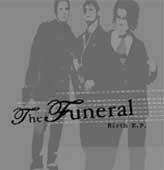 Anyway, that aside, by extracting two of the best songs from the EP and putting them on vinyl, The Funeral have created a single that i will listen to for years. Excellent work team.